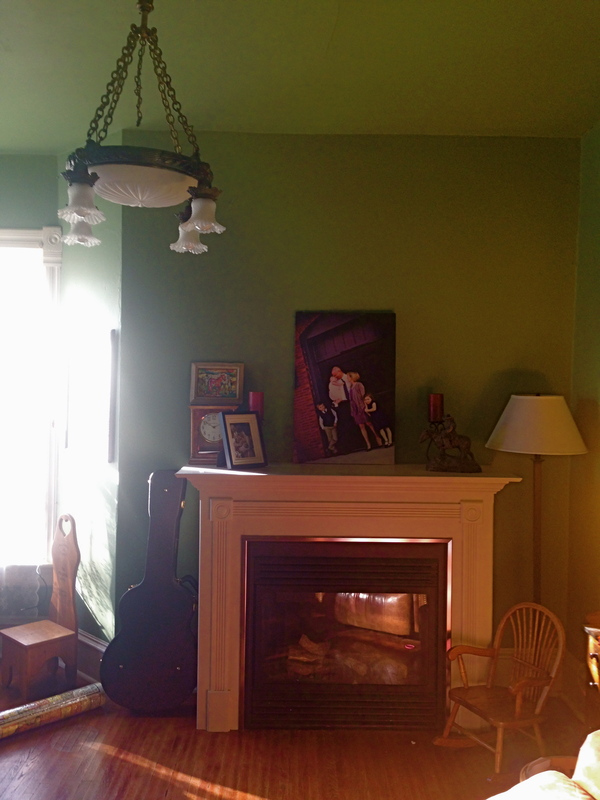 One of the mysteries of this house is the lighting. Pretty much 100% of the fixtures are newer, leaving me to wonder what the original lighting (after gas) was in our home. 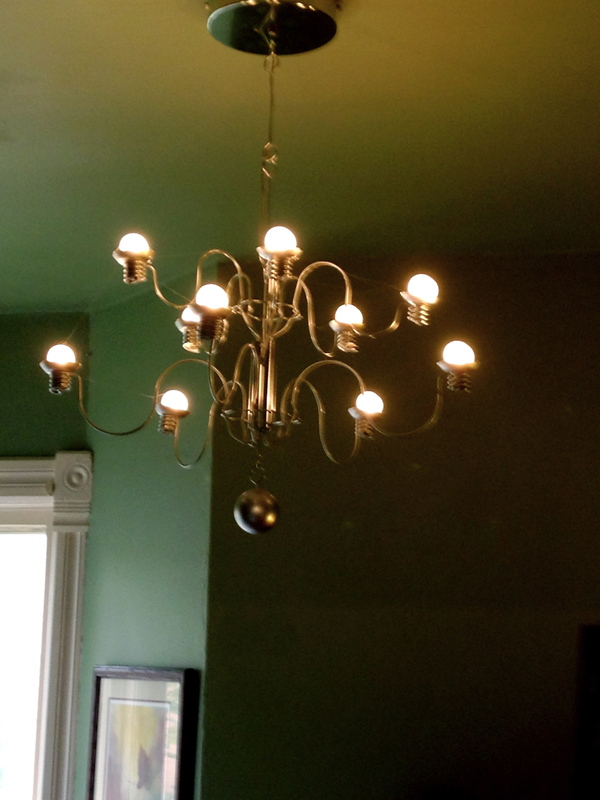 The “library” had a particularly modern chandelier in it, and was replaced with a craigslist find this weekend. It was from a 100 year old home a few blocks away. It was hard for me to decide if I liked it or not. 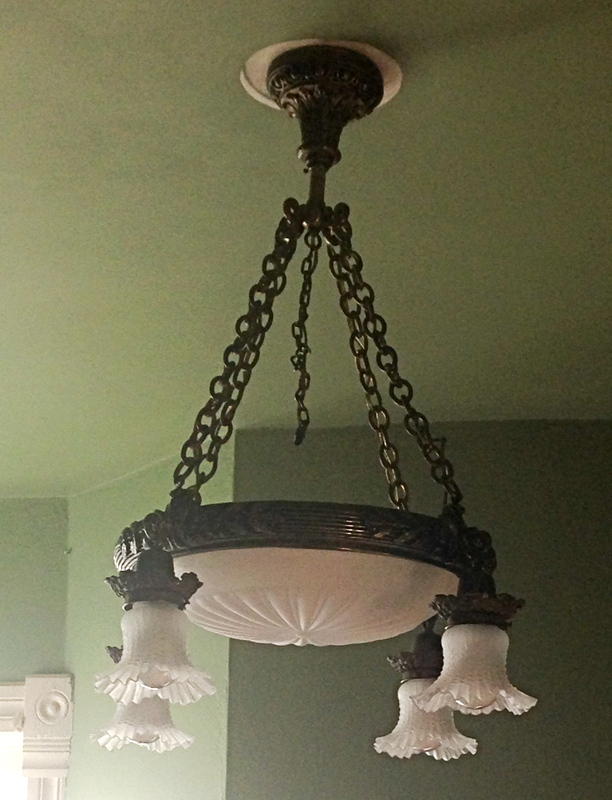 Victorian light fixtures are not really “in style” today. Is it ugly? Is it pretty? Is it funky? Is it period appropriate? Not sure… but now it’s mine. I think I like it… I might love it. I’m still trying to decide. It does give off a lot more light than the previous fixture did, and I certainly appreciate how it lights up the library in the evenings. The dark is finding us earlier and earlier this time of year, and I look forward to many evenings this winter close to the fire with a book or a board game, under the light of our new old chandelier. The craigslist find! Unfortunately, the center light no longer works. So awesome! I love that you are getting rid of the modern light fixtures and replacing them with lighting closer to the original time period of the house. Two of my favorite light fixtures were the only two originals left in the house, when my sister sold it. Unfortunately, the new owners replaced them with modern fixtures during the one year they owned the house (they are the ones who changed the kitchen/dining room wall among other “modern improvements”.). I’ve wondered ever since what they did with the original 100+ yr old fixtures, they were beautiful. I have always loved Victorians. I developed an interest in Victorian homes and house design in general at a young age due to growing up in this lovely Queen Anne. My husband and I talked about buying the house from my parents when they were getting ready to sell back in the ’90’s, but unfortunately the timing just wasn’t right for us at that time. So, I am very happy you and your husband purchased this home and I look forward to seeing your restoration process throughout the years. You are doing a wonderful job!! The new old fixture is gorgeous! Congrats! Even though the four small shades are not original (the original shades would have been a match to the big center shade), such shades can be found on eBay if you are diligent (and can find the time!). Thank you for your insight! This was our first vintage lighting purchase, and at $100 I am learning we got quite a bargain. I will have to try searching for original shades… my guess is I’ll pay more for them than the light? Yes, you got a fabulous fixture for $100! And four matching smaller shades can be found for under $100. Good luck!